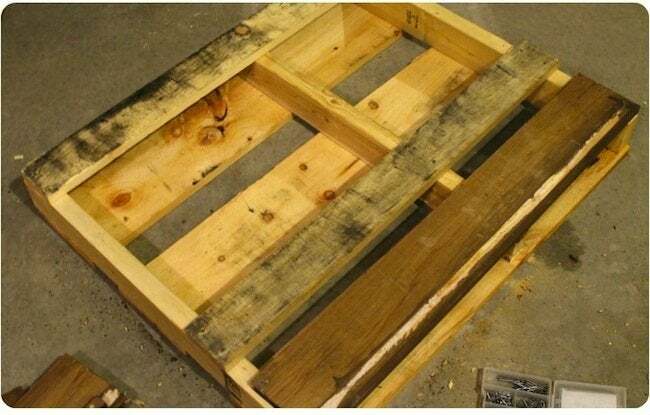 Most pallet projects look like, well, pallets. 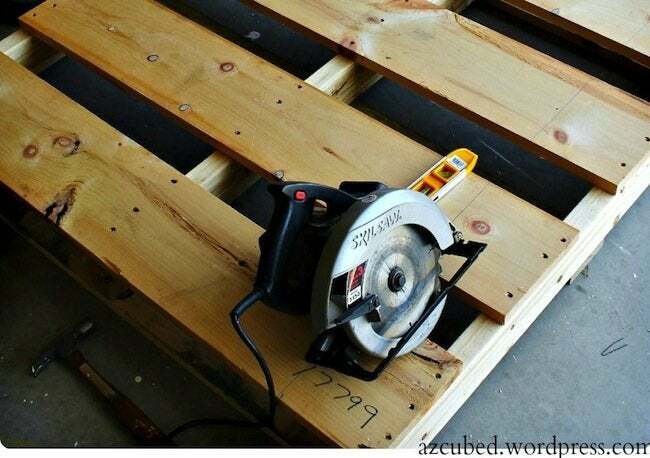 But this DIY ottoman could change the way you see wood pallets for good. I decided I needed to make it a bit smaller. It was just a little too big for the space. I cut it down to 36 inches by 30 inches. As you can see, the bottom side wasn’t totally filled in with wood, and I didn’t want any foam sinking into those gaps, or to have a hard time stapling the fabric on. So I sanded the entire pallet really well (I wanted to get off all the yuckies), and then I added plywood to the bottom side. 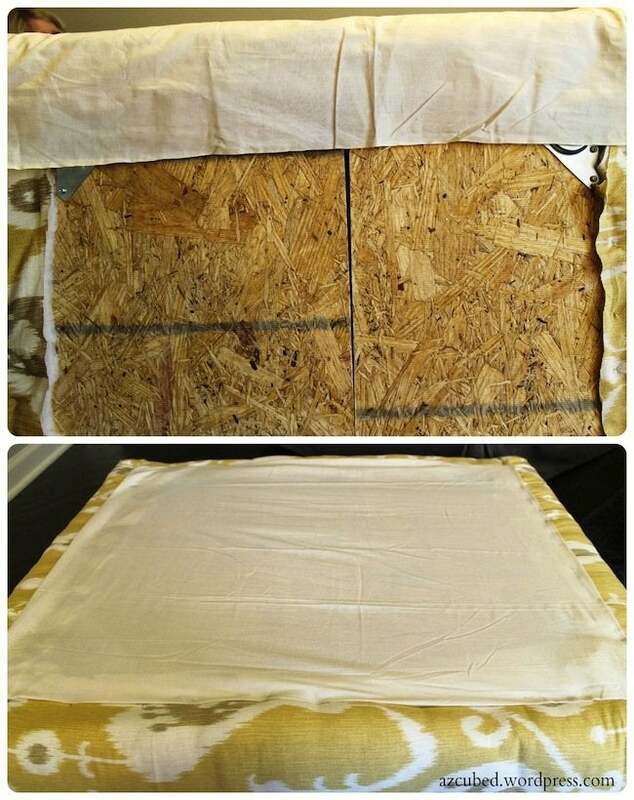 I cut the plywood into 2 sections, so I could cover the entire pallet. Then I nailed the plywood onto the base, and sanded the top of the plywood and along the outside edges. 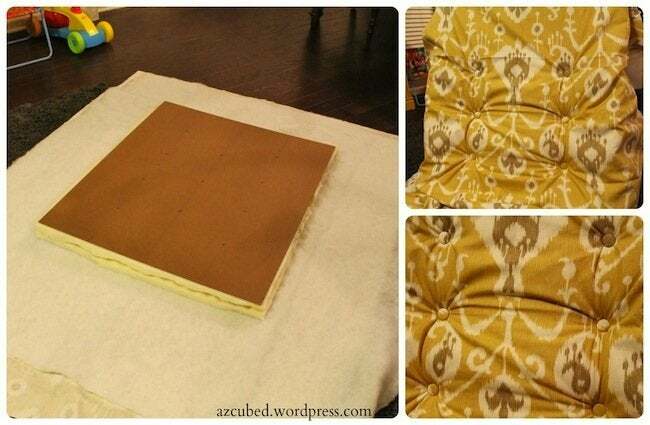 My next step was be to upholster. 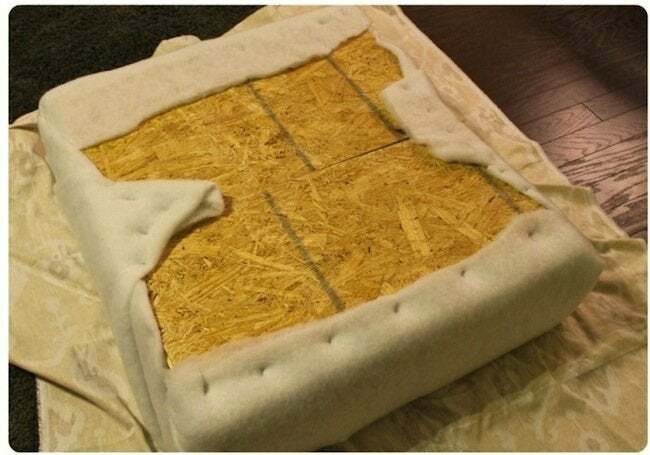 Before I could do anything with the fabric, I had to go to Home Depot and have a piece of wood (thin wood, like plywood, really thin) cut to the exact measurement of the pallet. 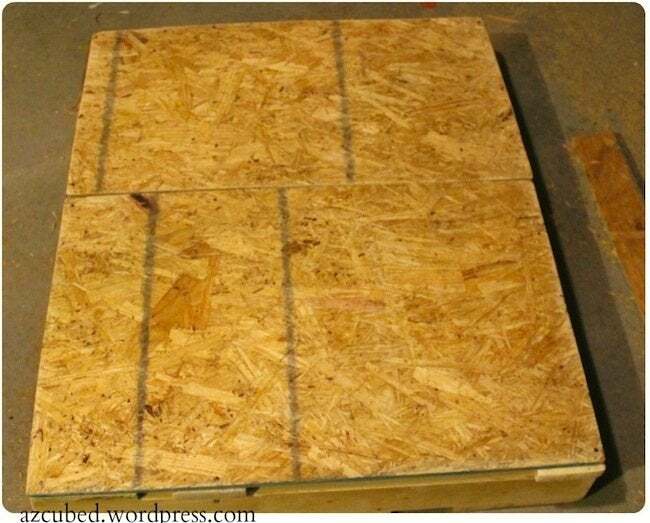 I would use this wood to put on the top of the pallet, and secure the foam, batting, and fabric to it. Next I purchased thick foam (can be found at any craft store), and batting as well. I cut the foam to the exact size of the top of the pallet (I used the thin wood as an outline, since it is the same size). 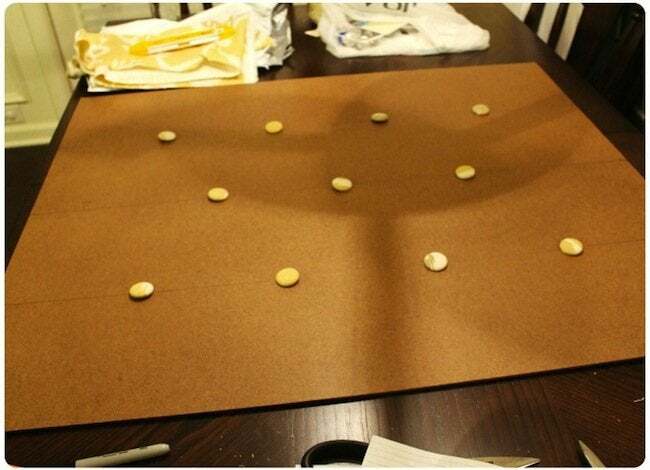 After this, I used the thin wood to figure out where I would put my tufting buttons. I measured everything out, and spaced 11 evenly on the board. I marked where each one would go with a sharpie, and then drilled a small hole in the wood at each point. Ok, so next I layed the fabric face down on the carpet, and placed the batting on top of that. I used spray adhesive to attach the thick foam to the wood, and then placed that on top of the batting (foam down, wood should be at the very top, facing you). For securing the buttons, I would recommend you have someone help you. Luckily I had both my mom, and my husband helping me, because I definitely could not have done this myself. You need an upholstery needle and very thick string (I used a thin cord). I put the cord through the needle, then doubled it over, and tied a knot at the end. I tied 3-5 more knots over that knot to make a large knot that would not be able to fit through the hole I drilled into the wood. I put the needle through the wood, then poked it out the front of the fabric. Then I strung the button onto the cord, and pulled the needle back through the same hole. When the needle comes out of the hole on the wood side again, then I tied more knots around the initial knot, ensuring it would not be pulled out. Make sure that when the needle poked through the fabric, the fabric was tight and not bunched up, and that the button is pulled to the same depth as the other buttons. Next, I took the pallet and glued the left over foam to the sides. I didn’t want any hard edges poking out, so I thought this would help with having a softer cushion on the outside. 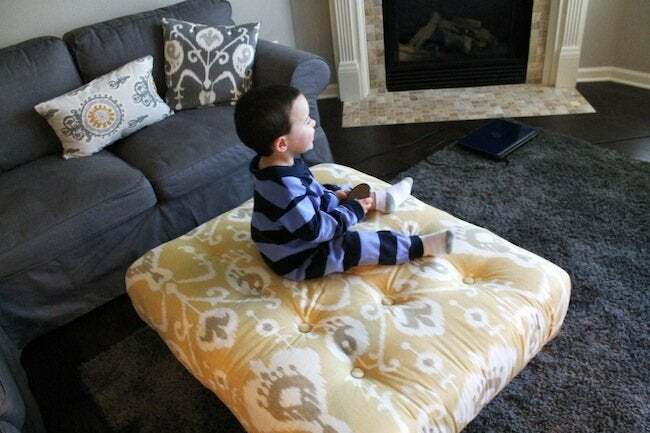 I also put the batting on top, so there are multiple layers of cushion. After this was done, I attached the brackets that would hold the legs. 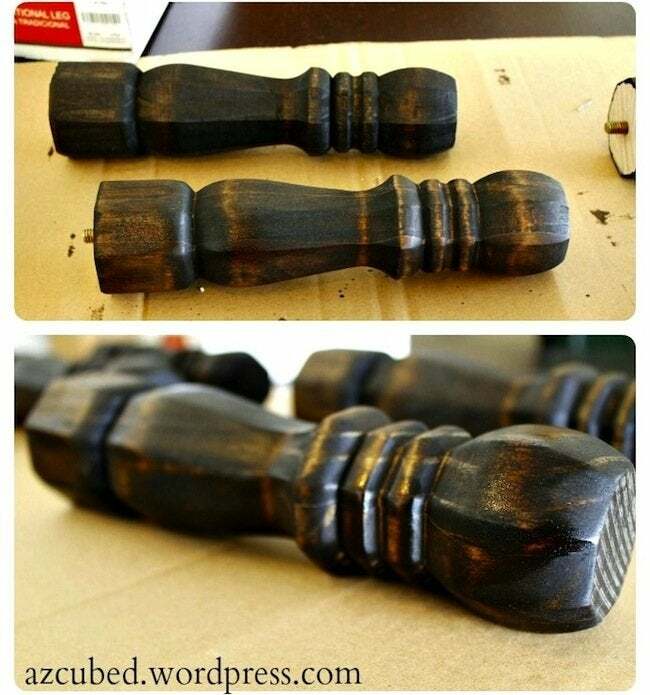 I stained the legs and let them dry. After the brackets were screwed in (the power drill is your friend here), I used a scrap piece of muslin to cover the bottom. I didn’t want the bottom to be exposed or have the possibility of little toddler hands playing with those staples on the bottom. I used hot glue to secure it around the bottom, tucking the edge under so it wouldn’t show. Lastly, I used a pair of scissors to poke a little hole where the leg would screw in (you don’t need a big hole), and screwed the 4 legs into the brackets. Thanks, Allyson! 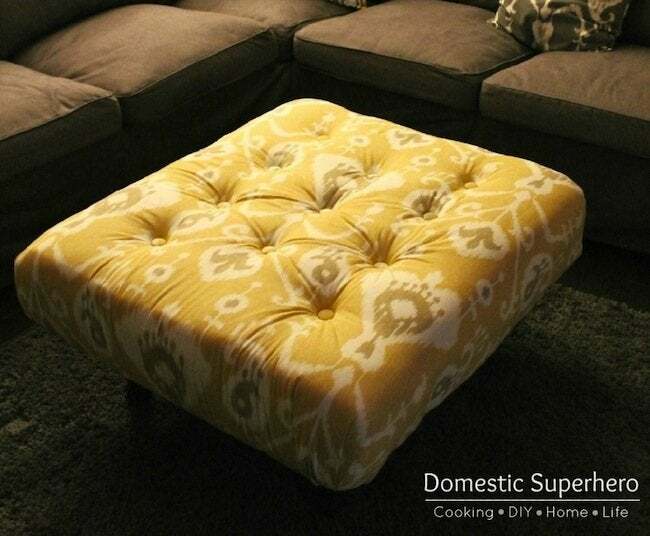 To read her complete tutorial, or find even more great DIYs, check out Domestic Superhero.